Hip, Hip, Hooray! Happy National Pig-in-a-Blanket Day! Certainly you remember this glorious day, when mom actually considered hot dogs “fine dining” and she allowed you to eat with your fingers and didn’t scold you? Well, today is that day! The American tradition of Pigs-in-a-Blanket consists of hot dogs, Vienna sausages, or breakfast sausages wrapped in biscuit dough, croissant dough or a pancake and then baked until golden brown. Yum! But did you know there actually ARE pigs in blankets? 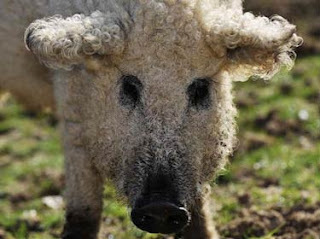 Prime examples of these superfluous swine are the Curly Coat pigs of Lincolnshire in the east of England (extinct since 1972) and the Mangalitza pigs of Austria and Hungary who sport wooly sweaters – they are literally, pigs in blankets. If these pigs had starred in the film version of the “Three Little Pigs” fairy tale, we might have been witness to a rendition including the famous one-liner, “And he huffed and he puffed and he………… laughed his you-know-what off!” However, that would not do justice to the blanket-like qualities that makes these pigs very hardy, helping them to survive in the harsh, damp and cold winters of their native lands. So, on these cool spring evenings, as you snuggle up in your “wooly” blanket don’t fret about that Big Bad Wolf damaging your home. Our knowledgeable agents at The Writer Agency, LLC can help you protect your property from wind and other types of damage, both natural and wolf-made. Call 308-436-4202 or click http://www.insurance-by-katie.com/ today! 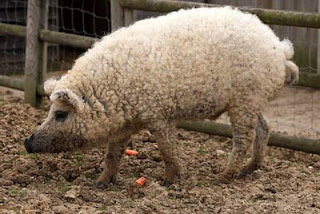 And don’t worry, we won’t tell these cute little guys what having a “pig-in-a-blanket” really means! Shhhhhh!